BuckleyGrayYeoman have finished a year-long refurbishment of the former Wickham’s department store in Whitechapel. From 2015, local campaigners have opposed proposals to remove the Spiegelhalter’s jewellers – the ‘missing tooth’ in the facade that even the original department store was built around, but for Dept W. this shop front now forms the entrance. The mixed-use development offers almost 110,000 sq ft of space, including Cat A workspace, a cafe, gym, auditorium and meeting rooms. Original glass domed ceilings, brickwork and hardwood floors have been carefully restored. 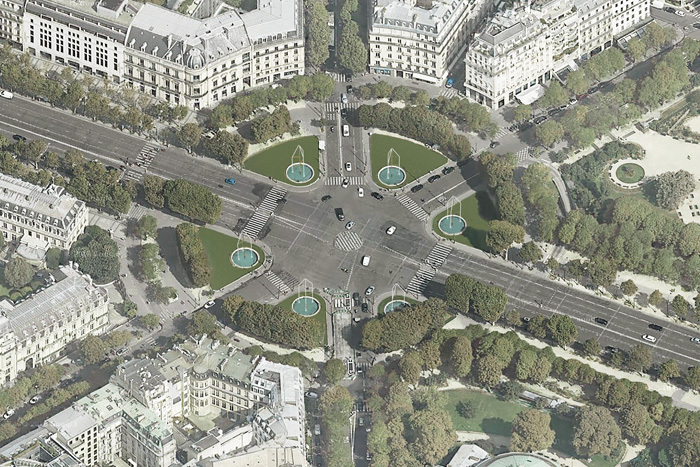 Designers Ronan and Erwan Bouroullec have created a series of six new illuminated crystal fountains, in conjuction with Swarovski and the City of Paris, installed on the Champs-Elysées last month. Featuring 3,060 crystals in total, the fountains were manufactured in close collaboration with Swarovski’s engineering team in Austria and are the first permanent outdoor installation featuring Swarovski crystals in the public realm. Carl Hansen & Søn is giving Bodil Kjaer’s architectural furniture series a new lease of life. In 1959, Danish architect and professor Bodil Kjaer designed an extensive range of furniture for both indoor and outdoor use. The clean and precise series was developed in dialogue with its surrounding architecture. 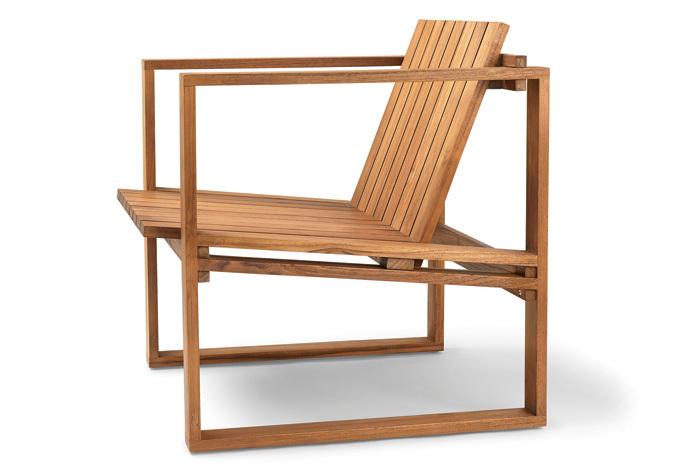 Called Indoor-Outdoor, the series now joins Carl Hansen & Søn’s collection of classic designer furniture. One of the most modern music venues in the world, the Zaryadye Concert Hall in Moscow, incorporates two performance halls and a recording studio. 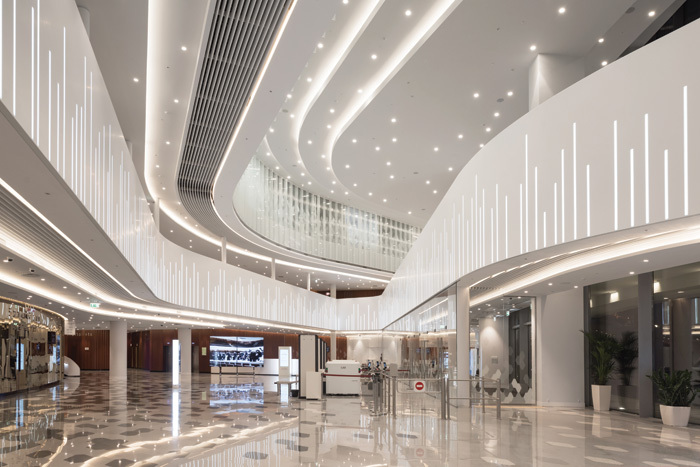 Some 6,000 sq m of HI-MACS Natural Acrylic Stone was used for the vast interior, creating an ambitious and elevating, state-of-the-art public building – an exemplar of modern Moscow’s ‘Star’ architecture. A large transformable space with a height of 20m, the concert hall is a perfect acoustic instrument. Latest generation engineering solutions, materials and technologies integrated into the building will enable resident musicians to bring their most ambitious ideas to life. Due to the seamless quality of HI-MACS, the interior fabrication flows from elegantly curvaceous balconies and stairwells to the main concert hall with its foyer, multilayered ceiling with light effects and stage design. Offering a visual contrast with ribbed mahogany surfaces, Diamond White HI-MACS comes alive at night, when the reflection of the interior is projected on to the dark space outside. Spotlights appear as floating stars, creating an ethereal cosmic display. To create impact and a memorable interior, architects at Moscow practice Reserve chose HI-MACS solid surface material for both its aesthetic and practical qualities: the finishing material needed to be hardwearing, easy to maintain and fire resistant. To fulfill the combined brief of aesthetics and functionality, the selected surface material needed to create a seamless effect over a large area, with curvilinear designs employing flowing forms. 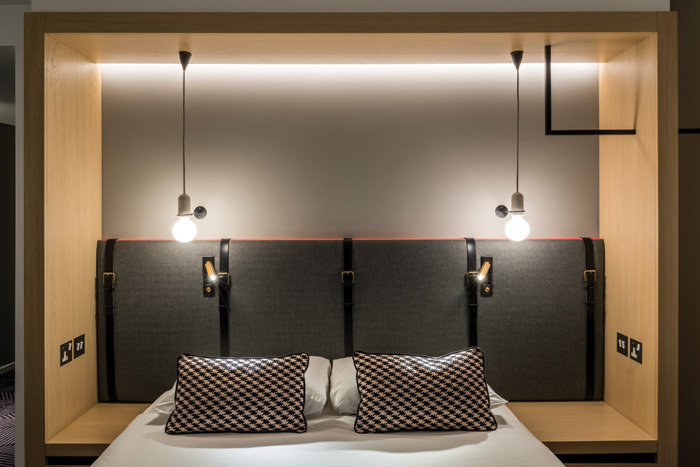 Independent lighting design practice Nulty has completed the lighting scheme at one of London’s newest urban-inspired hotels, the 10-storey Assembly, in Charing Cross Road. Working closely with architects at Scott Brownrigg, Nulty’s team was given a brief to reflect the edgy and urban tone of the Assembly brand. Sir Nicholas Grimshaw has been awarded the RIBA Royal Gold Medal for Architecture 2019, the UK’s highest honour for architecture. Approved personally by the Queen, the award is made to individuals who have had a significant influence on the advancement of architecture. Sir Nicholas established his own practice in 1980. Since then he has created an impressive portfolio of built projects across all sectors and worldwide. Daniel Libeskind is the latest architect to confirm participation in the RIBA + VitrA Talks series, with his talk taking place in London on 16 April and Istanbul on 18 April. The internationally acclaimed US-based architect will talk about the architecture of memory, place and people. Bathroom brand VitrA partnered with the Royal Institute of British Architects (RIBA) to launch the RIBA + VitrA Talks last autumn. The programme aims to showcase the best contemporary established and emerging voices in architecture, both in the UK and internationally, with talks taking place in London, Istanbul and regional cities in the UK. HLM Architects is one of only four architecture firms to make it on to The Sunday Times Top 100 Best Small Companies to Work for 2019. It has also retained its ‘Two Star’ accreditation status, for organisations making an ‘outstanding’ commitment to workplace engagement.